This initiative seeks to re-establish the traditional character of the 'Kataragama' initiation and pilgrimage by creating a sanctuary for the living tradition in the Okanda-Kudimbigala area, within the Yala East National Park, part of Deviyange Kaele or God's Own Forest. Any geographical site, from a simple shrine or meditation room to a national park or an entire community, may become a sanctuary if there is a consensus among the people who use that site that it should be free from weapons, intimidation, terrorism, anger, coercion, bullying and abuse of all kinds whether verbal or physical. 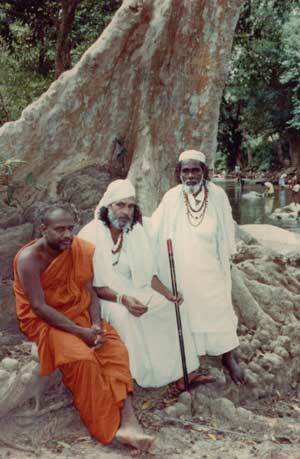 This is the essence of the Kataragama region's traditional atmosphere of inherent grace and mercy. Like a plant nursery, a Sanctuary or Sacred Grove may be regarded as a sheltered environment where peaceful thoughts and acts may grow strong enough to be carried forth and transplanted into the surrounding social environment. As nurseries of consensus or training grounds for new generations of peaceful, responsible citizens, sacred groves must play an important role in the revitalization of Sri Lanka's traditional culture of peace. Sacred groves have been an important part of Asia's and the world's cultural and spiritual heritage since early humanity first recognized the sanctity of the earth everywhere, but especially at certain sacred sites. The time has come to re-establish a traditional sanctuary, to realize a sacred grove or Heritage Conservation Zone, and the Kataragama region in terms of its cultural, religious, mythological and historical prominence is its logical home. Until relatively recent times, there was felt to be little need for eco-cultural sanctuaries or formal codes of acceptable conduct at sacred sites or shrines. However, with the steady intrusion of secular values and with the unbridled growth of commercial activity reaching into every nook and cranny of society including sacred areas, a consensus is now emerging concerning the need to protect threatened cultural treasures - traditional communities and their practices. As planners and facilitators, the aim of The Living Heritage Trust is to tap Sri Lanka's greatest sustainable resource - the cultural heritage of its people - and to harness it fully to achieve peace-education, non-violent conflict resolution and long-term sustainable development for the benefit of generations to come.